Two artists share their views and perceptions on colonial legacies and identities. 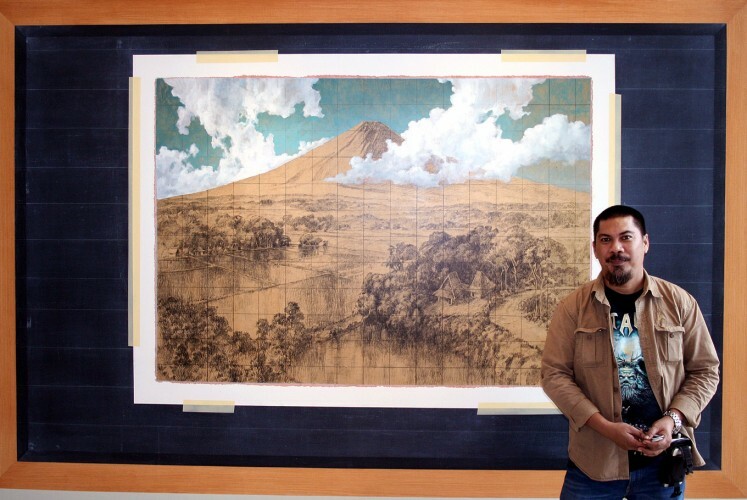 Indonesian painter Jumaldi Alfi, who hails from West Sumatra, and American-born multimedia artist Adam de Boer, who is of Dutch-Indonesian decent, have teamed up for an exhibition entitled “Legacies Real and Imagined”, held in the World Trade Center Building 2 ( WTC2 ) in Central Jakarta. Running until March 9, the exhibition was commissioned for the WTC2 by private property company PT Jakarta Land, in consultation with ISA Art Advisory. Also present at the opening of the exhibition were United States Ambassador Joseph R. Donovan and Alan Feinstein, the director of the American Indonesian Exchange Foundation (AMINEF). The decision by ISA Art Advisory to pair these two Yogyakarta-based artists in a single exhibition is interesting given the similarity in the source of the two artists’ subject matter. Jumaldi and De Boer have both been impacted personally, and in their artwork, by enduring issues stemming from Indonesia’s negative experience with Western colonialism. In the case of De Boer, who is descended from a family of Dutch-Indonesians, negative aspects of Indonesia’s colonial history have very much been embroiled with his own identity. During Indonesia’s post-colonial and anti-imperialist years under president Sukarno, the Dutch-Indonesians as a group were despised by wider Indonesian society as they were perceived as having enjoyed preferential treatment during Dutch colonization, on top of the colonial administration’s racially prejudiced beliefs. As such, De Boer’s family was forced to leave Indonesia in 1957 when they faced vengeful ostracism. They moved to Los Angeles in the US where De Boer was born and grew up around the surfing and skateboarding culture of California. During an interview with The Jakarta Post, De Boer described how his experience learning and practicing art in Indonesia since 2012 had been marked by a sense of discovery and re-connection to a heritage he thought lost after his family’s exodus. “I first came here with some surfer friends in 2010, kind of by accident. When I got out of the airport, I realized — hey the taxi driver looks just like my dad,” De Boer said. The Fulbright awardee said he realized there was something genetic there that related well to the country’s landscape. “Now, eight years later and with Fulbright funding, I was able to really dive deep into past traditions that I respect and love from Java, and figure out ways to combine them with more western practices to make mixed media pieces […]. I’m talking about mixed-race identity for my generation,” he said. De Boer related some of his artwork to the story of his Dutch-Indonesian grandparents and their forced exodus. He talked about his grandfather’s inability to protect himself and his inability to protect his family when Indonesia was under Japanese occupation and then through the independence process. His family’s story is particularly represented in the installation artwork entitled Room Screen for Margio Bin Suyeb, a reference to the 2004 novel Man Tiger by award-winning Indonesian author Eka Kurniawan. 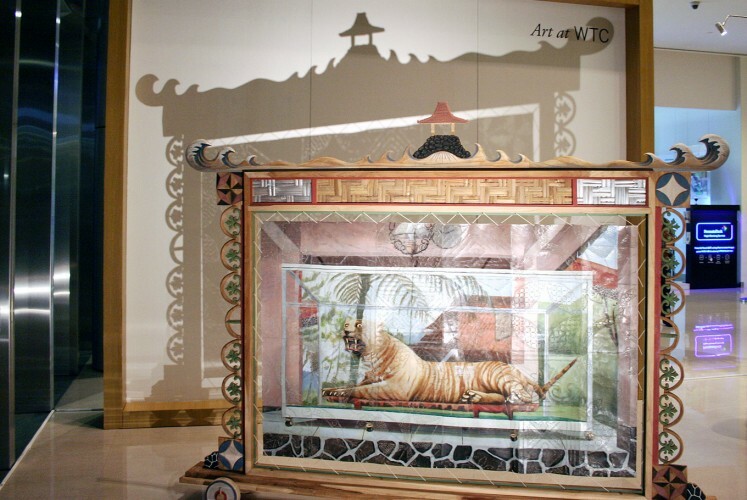 The installation centers on an acrylic and oil painting of an Indonesian tiger over a carved leather screen. De Boer said he had drawn and painted that same tiger around three times over the past five years. “Before it was more like an object in a box, but I felt this time that the spirit of the tiger was boxed in [with the artwork], which became a kind of metaphor for the social and political realities that my grandfather lived through,” he said. 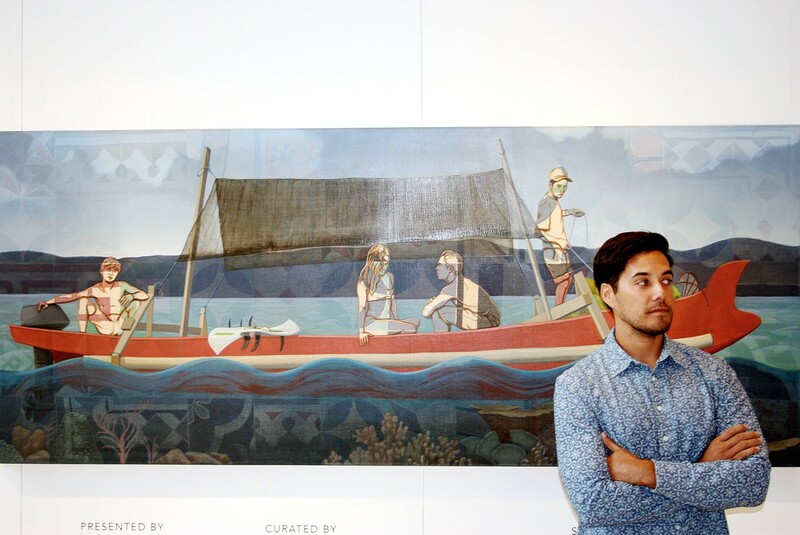 Meanwhile, Jumaldi’s artwork discusses issues related to Indonesia’s colonial past, as seen in his series of Blackboard Paintings, many of which parody and criticize the Mooi Indies style of landscape painting which was established by Dutch colonial painters in the 19th century. The Mooi Indies style of painting was highly misrepresentative of Indonesia, with the serene features of the countryside being used to promote the archipelago as a tranquil paradise for the audiences of Europe, Jumadi said. He claimed the style was historically misleading in its representations of Indonesia, as it ignored the suffering of the Indonesian people at the hands of colonialists, especially those in the provinces being painted. He is concerned that the styles and mentalities of the Mooi Indies painters have been adopted in the traditions of contemporary Indonesian art culture. He fears that a Mooi Indies mentality is continuing to prevent artists in Indonesia from properly representing the country by ignoring the harsh reality shared by many of Indonesia’s diverse lifestyles, and of the suffering of Indonesia’s poor and downtrodden. “Many Indonesian artists have still mentalities, just like the mentality of the Mooi Indies artists. Nothing has changed,” Jumaldi told the Post. Jumaldi, a co-founder of Jendela Art Group, is one of the influential contemporary artists in the country. His practice of analyzing Indonesia’s artists led to him analyzing the artist profession. He claims that artists bear a responsibility to serve and listen to the people of their country. “In Indonesia we don’t have anything […]. Now we just have art and culture. If we didn’t care about art and culture maybe we wouldn’t have anything. That’s my [sense of] responsibility,” he said.